Air Fryer Chicken Chimichangas are a healthier alternative to the deep-fried version that is served at Mexican restaurants. 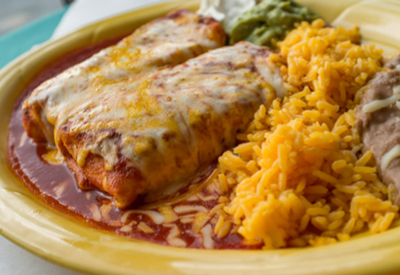 Chimichangas originated in the southwestern part of the United States. They are basically burritos that are filled with meat, cheese, rice and/or beans and then deep-fried in oil. Chicken Chimichangas made in the air fryer. The crispy burritos are then topped with red sauce, cheese, sour cream and guacamole. And of course, they are typically served alongside a bed of refried beans and Mexican rice. In an effort to eat a little healthier, but to still enjoy the classic taste of chimichangas, I knew that I had to try out Air Fryer Chicken Chimichangas. We have fallen in love with our air fryer. We have made everything from fried chicken tenders, french fries, hamburgers, and more since we purchased it. The major benefit of using an air fryer is that you can use little to no oil in recipes that are typically drowned and cooked in a deep fryer. 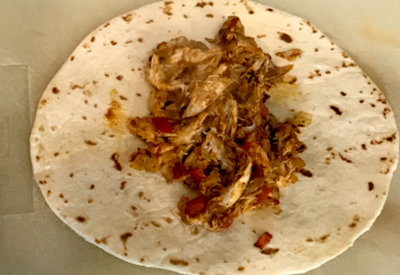 We always have cooked shredded chicken on hand – especially after making Instant Pot whole chicken recipe. That means less fat, fewer calories, and no more splashing and getting burnt by hot oil. That was the main reason that I purchased our BCP 5.5 quart Air Fryer. Little did I know that many of the recipes that I would be making would take way less time and energy than when cooked the traditional way. Instead of pre-heating our oven for recipes, all I have to do is preheat my air fryer for 3 minutes and it is ready to go! No heating up the kitchen on hot days! And no standing over a hot grill or an open fryer filled with boiling oil. So when I went to try out my Air Fryer Chicken Chimichangas, I had high hopes! It is best to use soft taco tortilla shells for this recipe – they are the perfect size! 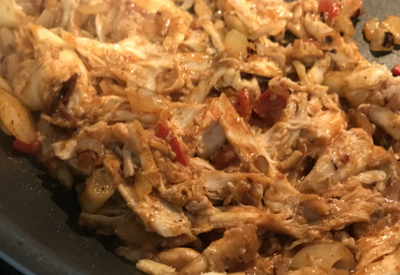 I started off using shredded chicken that I had left over from our Instant Pot Whole Chicken Recipe. We will always keep leftover chicken for quick and easy, weeknight recipes. I added some onions and peppers to a skillet and then added enchilada sauce and the shredded chicken. I then filled soft taco tortilla shells with the mixture and topped it with shredded cheese. Folding the burrito is easiest when you fold the two sides in first and then roll the burrito. Place the seam side down in the preheated air fryer and cook for 6-7 minutes. 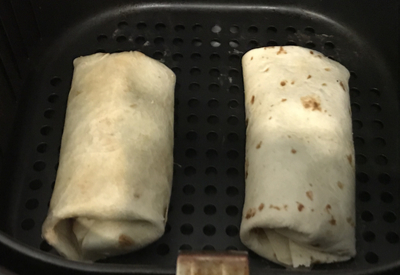 Burritos rolled up and placed in a pre-heated air fryer to make chicken chimichangas. They turned out absolutely delicious! A crunchy tortilla shell that tasted just like it was deep-fried! Another recipe that can save you time and energy any night of the week! A quick and easy to make meal - Chicken Chimichangas made in the air fryer rather than the traditional deep-fried method. In a medium size skillet heat 1 teaspoon of olive oil. Add diced onions and sauté for 2-3 minutes. Add diced jalapeno to the pan and sauté for an additional minute. Stir in garlic powder and cumin with the onions and peppers and then pour in 6 ounces of the red enchilada sauce to the mixture, stirring until well combined. Add the cooked and shredded chicken to the skillet. Heat 3-4 minutes until warm and the mixture has thickened. Remove from heat and set aside. Heat up the 4 tortillas in a clean skillet or in the microwave for 15-20 seconds. Fill each tortillas with about 3/4 cup of the chicken mixture and fold them into a burrito shape. (Fold in the 2 sides first and then roll it up and place the seam side down. Preheat your air fryer per your manufactures instructions. Set your air fryer to 400 degrees and place the chimichangas in the basket. Spray the tops with some grapeseed oil and cook for 6-7 minutes. 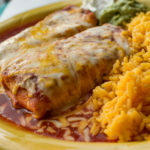 Optional: After 6 minutes of cooking, add the remaining enchilada sauce to the top and sprinkle with mozzarella cheese. Finish cooking for 1-2 more minutes. Serve warm with rice, beans, and pico de gallo.